Coimbra, a city of Portugal, capital of the province of Beira, 120 m. N. N. E. of Lisbon; pop. about 19,000. It is situated on the river Mondego, in the midst of a mountainous but fertile and well cultivated tract. 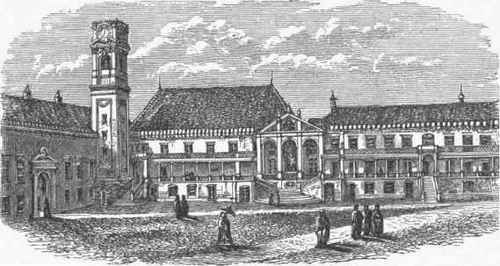 Its principal public building is the university, the only one in Portugal, founded at Lisbon in 1291, and transferred hither in 1308. It consists of 18 colleges, is divided into 6 faculties, employs 33 professors in ordinary and 22 assistant professors, has a library of over 30,000 volumes, and is attended by about 1,500 students; it is highly endowed, the courses of study are long, and the annual examinations are said to be severe. Coimbra is the seat of a bishopric, and has the wealthy Augustinian convent of Santa Cruz, with its immense Gothic structure. There are also a college of arts belonging to the Jesuits, a cathedral, eight churches, and several monasteries. On a hill near Coimbra is the splendid convent and church of the nuns of Santa Clara, and in the valley of the Mondego opposite to it is the Quinta das Lagrimas, famed in poetry as the scene where Ines de Castro was slain. Seven kings of Portugal were born and four died here, and several princes derived their title from the town. Coimbra is said to be the Co-nimbrica of the Romans. It sustained many sieges in mediaeval times.